Floats have got bigger and more foreign companies are listing. 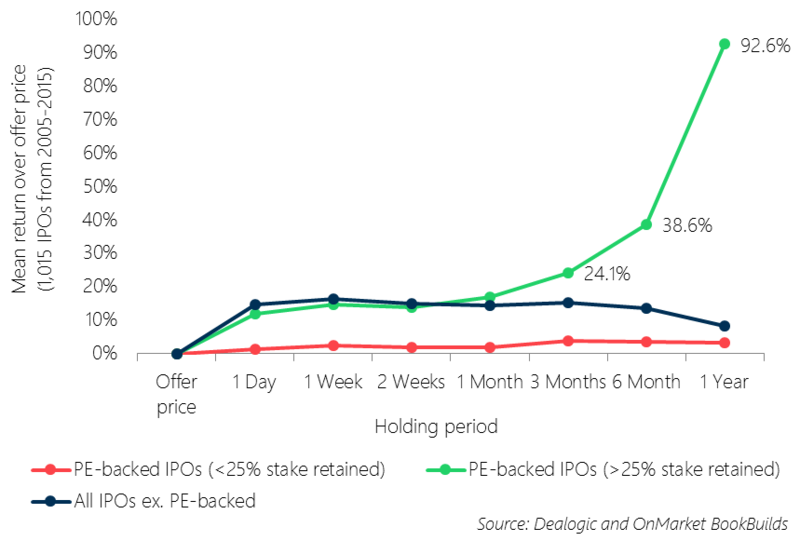 It is not uncommon to hear some investors declare they won’t be investing in initial public offerings (IPOs) because they supposedly have higher risk. Headlines such as “Investors grow nervous as floats start to sink” perpetuate this view. Yet robust returns on IPOs suggest the exact opposite. If you had invested the same amount in every IPO on ASX last year, the return would have been 23 per cent by year’s end, which easily outstrips the total return for the S&P/ASX 300 over the same time, of negative 1.87 per cent. The longer-term returns for IPOs are even more telling. Over the 10 years from 2005 to 2015, investing in all IPOs would have returned an average of 14.8 per cent at the end of the first trading day, 14.5 per cent at the end of the first month and 15.6 per cent after three months. So how do you start investing in IPOs? The important thing is to get a diversified exposure to the floats of companies backed by solid numbers and solid growth plans. Australia’s IPO market allows you to enjoy good exposure to a broad range of companies, with more technology, finance and professional services companies listing these days, taking over from the resources sector that dominated 10 years ago. IPOs are also getting bigger. In 2015, 37 per cent of floats were valued at greater than $50 million, compared with just 12 per cent of floats in 2010. More foreign companies are listing here, with a record 20 per cent of ASX listings by offshore businesses in 2015, bringing even greater diversity. There has also been a jump in private equity-backed IPOs, representing 22 per cent of all IPOs in 2014, well up from 1 per cent in 2006. If you are thinking of buying into an IPO, there are some key things to consider, keeping in mind that not all IPOs are created equal. It is important to spread the risk among different IPOs. 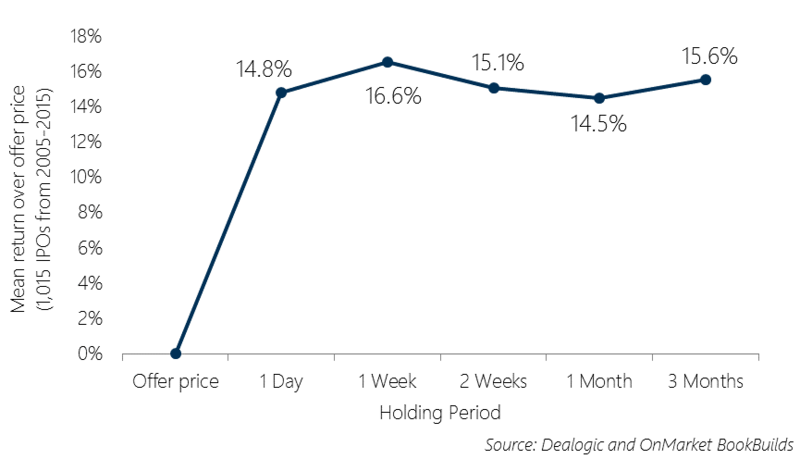 Despite the recent publicity about companies floated by private equity firms, returns have generally been impressive, as the chart below clearly indicates. In particular, where the firm has retained greater than a 25 per cent stake in the company listing, the first-year return is a staggering 92.6 per cent over the past 10 years, compared to 8.1 per cent for non-private equity floats. With this in mind, check how much “skin in the game” a private equity firm is retaining in a float (ie its share ownership). Institutional investors typically meet the directors and senior managers of companies floating. A retail investor rarely gets this access. However, you can gain insights by researching the track record and experience of the directors and managers listed in the prospectus. Do your due diligence, including a Google search and search ASIC’s registers. One piece of negative press may be a misunderstanding but several negative articles should be a concern. The financial status of the company is vital, but how you measure this depends on the company’s stage of development. A common method of valuation is to compare the company’s financial position (using information from the prospectus) with organisations in a similar industry. Earnings per share (EPS). You can calculate this by dividing the company’s earnings by the number of shares in the company. When comparing EPS figures, make sure the earnings figures are calculated consistently. For example, are both figures based on earnings before interest and tax? Also, be alert for one-off items in the earning figures. The key is being able to compare apples with apples. Price-to-earnings ratio (P/E). Calculate this by dividing the price of the shares by the EPS. The P/E ratio represents the dollar amount the shareholder is paying for each dollar of earnings. For example, if a company has a P/E of 9, the share price is implying that each $1 of company earnings is worth $9. A lower P/E could indicate better value. Companies in this category may have a limited financial track record and may not be making a profit. Therefore, investors are valuing the company on the growth opportunity outlined in the prospectus. There are, however, a number of factors to look out for. Look for anything that will benefit third parties, such as excessive fees being paid to advisers. Ensure the stated revenue relates to the ongoing business proposition outlined by management. Look for one-off items such as unrelated sales and government grants. Assess the figures critically and decide if management is realistic in its assumptions, particularly about how long it will take the company to become profitable. 6. What is the product/service and how big is the market? Companies should be clear in the prospectus about what their product or service is and why it matters. If it is hard to understand, approach cautiously as it is a good bet that others will also find it complex. The size of the opportunity and the company’s ability to capture market share can make all the difference when it comes to growth and shareholder returns. Keep in mind that the size of the market is only an estimate based on many assumptions. These assumptions need to pass the commonsense test. 7. How is the offer structured? If the offer is structured so that options, convertible notes or performance shares will automatically be issued to the seller at a future date, this may dilute your shareholding. Remember, each share you buy represents your piece of ownership of the company. The more shares on issue, the less value each one represents. Retail access to IPOs, especially sought-after ones, is hard to come by. It is a good idea to sign up with a stockbroker as well as IPO portal OnMarket to help you to get a decent allocation in the next great IPO. Using the OnMarket app, it’s free to sign up, bid and invest in IPOs. For retail investors who can’t get a one-on-one meeting with a chief executive or other managers, OnMarket fills the gap, giving investors access to relevant information on IPOs, including video interviews with management and independent research. The performance numbers above suggest that a percentage of any well-diversified portfolio should be allocated to IPOs, either as a short or long-term holding. Keep in mind that the same investment principles apply with this asset grouping, do your homework and diversify your investment by investing in a spread of IPOs. Rosemary Kennedy is Managing Director, OnMarket BookBuilds, and has more than 25 years’ experience in the financial markets, including senior positions at ASIC, ASX and UBS. OnMarket BookBuilds is a fintech company that has revolutionised the way capital raisings are offered. Its new online investment portal, OnMarket, is the world’s first free-access portal that enables all investors to easily access IPOs and placements conducted by ASX-listed companies. It also curates third-party research, interviews with management, and other information for investors. ASX Upcoming Floats has more information, and Recent Floats and Listings provides information on entities that have listed on ASX in the previous two months. This article appeared in the June 2016 ASX Investor Update email newsletter. To subscribe to this newsletter please register with the MyASX section or visit the About MyASX page for past editions and more details. This article appeared in the June 2016 ASX Investor Update email newsletter. To subscribe to this newsletter please register with MyASX. This article appeared in the June 2016 ASX Investor Update email newsletter.